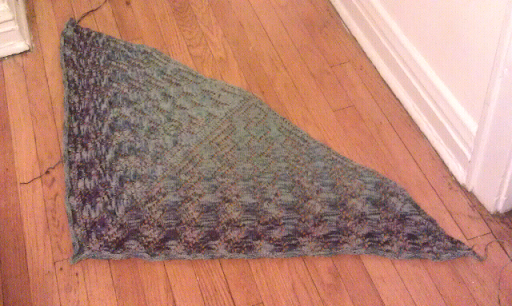 Part of what makes my Denise Shawl special is that I also designed the colorway specifically for this shawl. I wanted there to be a gradient of color like from my cake dyeing experiments but I also knew that for the large version of the shawl I would need more than 100 g of yarn. 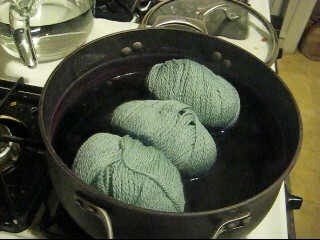 My solution was to dye THREE balls of commercially wound KnitPicks Palette Yarn (color Sage). I have dyed a lot of 100g skeins of yarn, but I knew that I would likely need more than 100g for the Denise Shawl project. I decided to overdye a color other than bare. 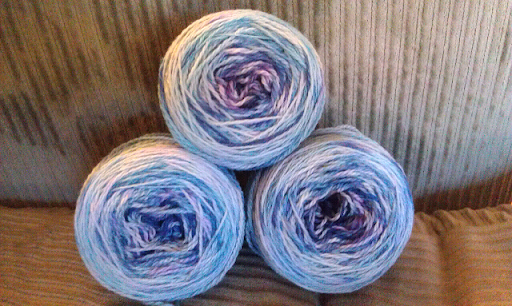 I selected this color in part because it was on sale (Hurrah for Cyber Monday Yarn Sales!) 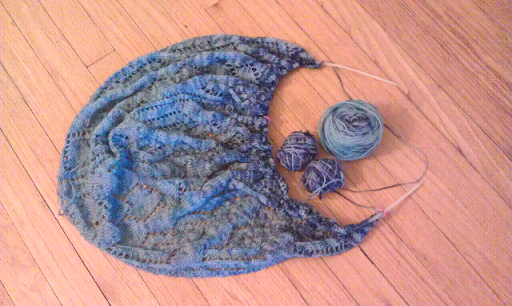 but also to give some more dimension to the whole shawl. To start off, I had a dyebath of 8 cups of water, 1/2 cup of white vinegar and added a mixture of McCormick's liquid food coloring and Wilton's paste. After 10 minutes of cooking in the vertical position, the balls of yarn were rotated to be completely submerged for another 10 min of simmering. During the first 10 min, most of the color absorbed to the yarn, so if you want a little more coverage I would wait 5 min during my next attempt. 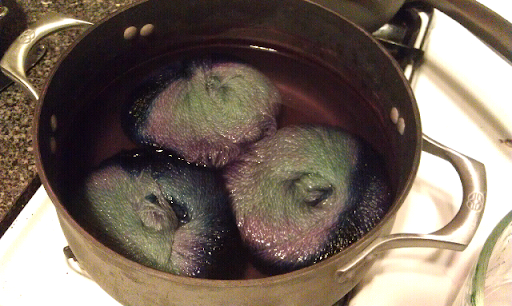 Once the heat was turned off, the balls of yarn cooled in the pot (to allow any remaining dye to absorb). 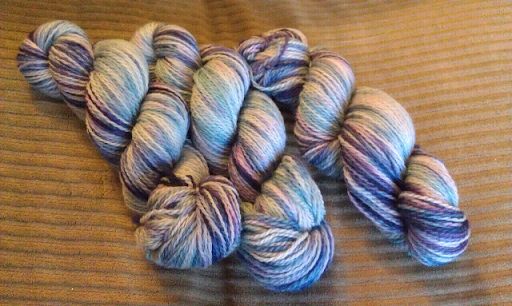 The yarn was washed with luck warm water and dish soap (off camera). The Video - Watch exactly what I did! The coloration of the balls was really cool. I loved how the colors played out towards the center of the balls (see picture below.) The effect would have been different if I had submerged the balls from the start of dyeing, but I wanted there to be some consistency and have some colors carry through most of the shawl. I knew that I would not end up with three identical balls of yarn, and I also didn't want there to be stripes in the shawl. By using three different balls of yarn this would allow me to get a greater proportion of saturated colors near the outer edge of the shawl. I created the continuous gradient by alternating balls of yarn ever two rows and then adding the third (starting at the darkest portion) when I reached the end of the shawl. 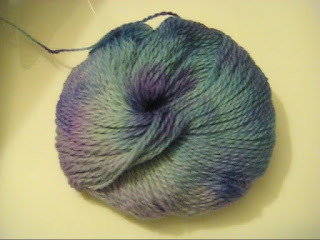 I am very thrilled with the over all effect I got from Dyeing for my Denise Shawl. What kind of project would you like to apply this method to? Purchase the Denise Shawl for $5.00 USD. Wow! Love the colors -- excellent job! I am not a huge sock knitter, but I always thought this technique would look really cool on socks. Especially toe up where you can take advantage of the most saturated colors.